Home > MapleStory 2	> MapleStory 2 Update Timeline! NOTE: I won’t be covering every single patch, only the big ones and major updates. A lot of MS2’s patches are minor changes to skills/maps/systems or just events so I’m only going to be focusing on new content. Almost 3 years ago, MapleStory 2 was officially released! This is the base version of the game and a lot of changes have been made since then. I made a comprehensive guide which covers a lot of the basics from back then! The game launched with 8 classes: Knight, Berserker, Wizard, Priest, Ranger, Heavy Gunner, Thief, and Assassin (plus the Beginner job!). The Season 2 update was the first big patch. It increased the level cap to 40, added new skills to all jobs, new bosses, areas, and dungeons. I covered this one in a previous post. The Season 3 update increased the level cap to 50, added new skills to all jobs, new bosses, areas, and dungeons. This included Balrog! I covered this patch as well. This patch was focused entirely on optimization! They added a feature to automatically optimize the game’s settings based on your computer. Here’s a few more videos showing off the changes: 1, 2, 3. Although the developers said they didn’t want to add new jobs anytime soon, only 6 months after MapleStory 2’s launch, the first new job, Rune Blader, was released. Rune Blader uses the two-handed Blade and combines it with magic enchantments that give their attacks elemental power. This patch added three things. The first was the Fishing system! You can buy fishing rods and bait then use them to fish. 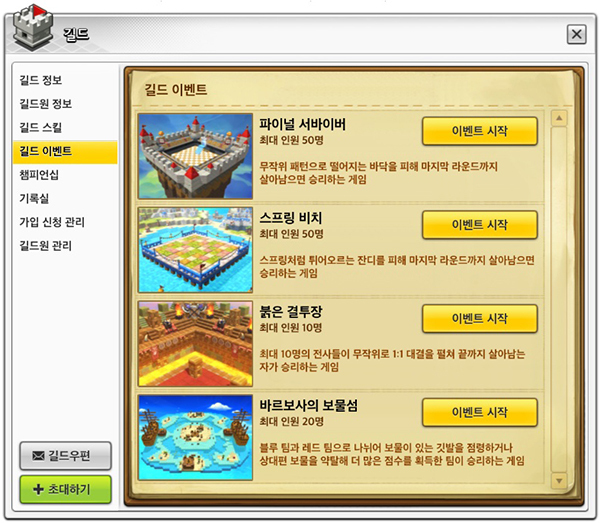 Since it’s MapleStory, you can fish in water, oil, poison, lava, and more! You can fill out your fishing journal and receive special fish themed rewards. The second was the Music system! You can purchase a piano or guitar and play songs on them using your keyboard. You can create or purchase Music Sheets that automatically play composed songs. You can also create ‘parties’ to play songs together with others. Here are a couple of examples: 1, 2, 3. Finally, this patch added Karkar Island, a new area. It has its own set of new high level dungeons (most of them level 50!). A new boss was added in Karkar Island, Verekant (aka “definitely not Magnus”). This patch also added pets! You can buy them in the Merit Market. Pets can automatically revive you, use potions, and loot items (they have their own inventories). They’ll also have a unique pet skill that gives stats. Pets last 30 days. After that, you can no longer summon them. You’ll need to buy food in the Premium Shop to extend their life by a certain number of days. You can actually buy pet related items in the Black Market from other users, as long as they haven’t used them yet. The Maple Arcade has been added, it allows you to play special arcade games and compare your score with other players. They added two so far, Spring Farm and Crazy Monkey Ocean! The new Maple Guide gives you special rewards when you reach certain levels, recommends various content based on your level, and gives daily missions that you can complete for rewards. Maple Arena is a new PvP mode that has true 1 on 1 fighting. You can face another player and whoever wins 2 times wins the battle! A new area called Coco Island has been added, it’s the largest fishing area in Maple World! Epic quests’ experience rewards have been greatly increased (so you can easily level up just by doing them). Certain Epic quests now have a ‘Finish and Go’ button that allows you to instantly return to an NPC whose quests you have completed. The quest helper UI now has 10 pages, each of which can have 4 quests registered. Three new instruments were added: Violin, Cello, and Flute. The first patch of the Double Impact update was to increase the level cap to 99. They added the Characteristics system that allows you to collect Characteristic Points (10 from an Epic Quest and then 1 every time you level up 50+) and spend them in 5 categories (Character/Battle/Exploration/Quest/Life) to get various boosts (e.g. boss damage). Shadow World was reorganized. Instead of accessing it through various portals throughout Victoria Island, it can only be accessed through the Shadow Gate map. It is now a separate island on the world map and only one map features PvP. It also has new Twisted Spaces which are special missions you can complete at random. It has a new type of currency called Treva which you can collect from completing missions in Twisted Spaces. The existing currency Karma has been removed. Sockets and Gemstones have been added. Accessories can now have up to 3 sockets into which special Gemstones can be equipped. However, to unlock these sockets, you’ll need to combine 2 of the same item. You can now change the additional options of accessories by talking to Ophelia. Guild levels, skills, and events have been added. You can level up your guild up to 25, unlock and use various skills, and participate in events with only your guild members. The maximum number of guild members has been increased to 70. A Return to Previous Location button has been added when you teleport back to your house, allowing you to return to the map you came from. Skin and Gemstone items now have their own tabs in the inventory. This patch also included 1st anniversary events, but they didn’t seem very big to me. From what I see in the patch notes, it was just collecting coins to spin a wheel for prizes and a couple free items given away. MapleStory 2’s second new job, Striker, has been added! Striker uses Knuckles and is a melee-specialized character with relentless attacks. Three new instruments were added, the trumpet, trombone, and saxophone. The Double Impact update added another new job, the Soul Binder! Soul Binder uses her Orb for both ranged attacks and heal allies. The last patch of the Double Impact update added the “final” boss Kandura. In preparation for MapleStory 2’s biggest update yet, they added a test server for the first time called the Reset server. It was open to everyone for one week to test the new update. You can no longer die from fall damage. In this patch, Karkar Island received a new set of level 50+ Epic quests (the old ones were removed in the Restart update) along with new Adventure/Raid/Chaos Raid dungeons. It also added new Life Skills: Herb Gathering, Alchemy, Crop Growing, and Cooking. Skin items can now have Sockets, into which you can install Gemstones that give you stats. You can now gain Skill Points from certain trophies and Epic quests (in addition to levelling up). The maximum level of skills has been increased (to 22 for Beginner skills and to 10 for job skills). You can now gain Stat Points from certain trophies, Epic quests, and exploration achievements. They can be distributed to the following stats and can be reset at any time. Guild content has been reorganized. 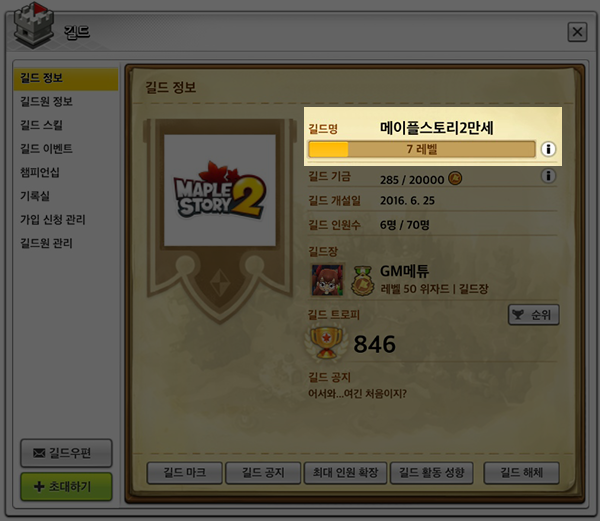 The maximum guild level has been change from 25 to 10 (all guilds’ existing levels have been reset). The Guild House has been added. Based on your guild level, your limit to members, guild skills, and guild house NPCs will change. Epic quests have been reorganized (they really do this a lot). Level 1~30 quests have been changed. New opening footage and early story quests for certain jobs have been added. Epic quests are now divided into Chapters, based on the story. A new type of raid, the Reverse Raid has been added. You can investigate the portal in the center of the Reverse Gate to challenge the Tree of the Devil, Zakum! Reverse Raids award Reverse Coins which can be used to buy new Reverse equipment. All pre-existing pets were classified as Companion Pets. If you are level 50 or higher, you can tame hungry monsters in hunting maps and turn them into your Battle Pets! You must use Candy (purchased from towns) to turn them into gentle monsters, then throw a Capture Capsule (can be made using a Life Skill) to try and catch them. Only certain monsters can be caught. The Life Skill: Pet Capture has been added. You can also obtain Battle Pets from Random Raid Dungeon rewards. Battle Pets have ranks, and based on that, they’ll have a certain number of abilities and require more experience to level up. You can summon a tamed Battle Pet to fight with you. They will gain experience with you and as they level up, their abilities will be unlocked. All pets have automatic revival, item loot, and potion use. You can combine Battle Pets to level them up. Once they reach level 50, they can no longer level up or be used to level up another pet. Protect the Temple of Time against a strange creature from another world, Pink Bean! A Navigation system has been added that guides you towards the objectives of your current quests. 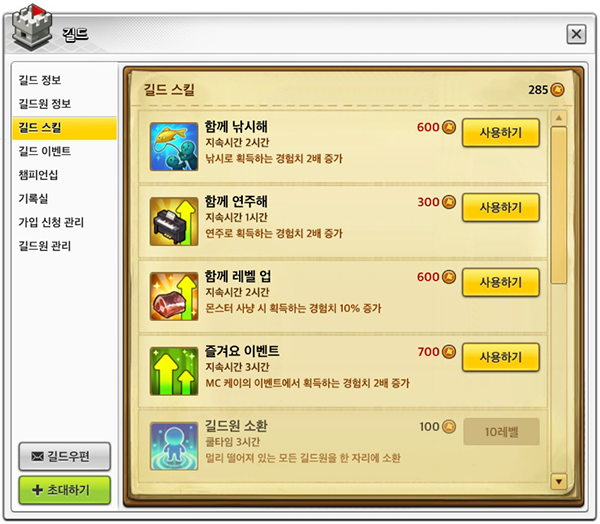 Level 31~45 Epic quests’ story and contents have been renewed. Maximum guild level has been increased from 10 to 15. Guild Coins have been added that you can use to purchase items from the Guild House stores. Level 50+ adventure dungeons’ difficulty levels have been adjusted. Difficulty of all Raid and Chaos Raid dungeons have been adjusted. Dungeon rewards have been increased. A new Raid you can complete with your guild members. You can now use the Transcendence System on items level 50+ (hats, tops, bottoms, gloves, shoes) to give them a Transcendence Option. An item can only have one Transcendence Option. If you try and Transcend it again, it will be replaced with another one. Join the flying ship Sky Fortress and defend Maple World in this new Epic quest line! A new type of dungeon called the World Invasion has been added, the first of which is the Infernog Last Line of Defense! Instead of how a regular dungeon works, against Infernog, you must survive for 15 minutes and deal enough damage that the Sky Fortress’ charged up weapon is enough to finish him off. Yeah that’s actually it, they haven’t had any other big content updates since January haha. In this section I’m just gonna link some things you guys might find useful. They’re all in Korean but you can use Google Translate and probably understand most of it! Official guides for the various systems of MapleStory 2. You can see overviews of each job, a quick showcase of their gameplay, and a list of all of their skills. This page has descriptions for each job, as well as story synopses for each area of Maple World and has small overviews of the game’s different content. The page also links to guides for different level ranges and guides for item farming. I really hope they release GMS2 with all previous patches included but I feel like it’s a pipe-dream for a company like Nexon. Prove me wrong Nexon! Based on the content they teased for launch, we will at the very least have 2D zakum (june 2017). If they launch any closer we’ll be waiting a year or more for content after sky fortress when accounting for translation and QA time. But, at the same time, Dance Dance Stop was a minigame at MapleFest and that’s after Rune Blade but before Zakum… I have no idea what they’re thinking. I read on the official site that the game checks your computer’s specs to decide what to play in for the first time, so I know for a fact we have the Optimization patch right out of the gate. I wouldn’t mind not having all the content at once. Having too much content right off the bat might be a little too overwhelming and it may cause players, like in MS1, to skip large portions of the game because it’s made irrelevant by new content. I hope we start at least at the Restart patch in order to avoid a large and awkward transition after release. However, I don’t want to start too far ahead because that means patches will come much slower. Someone tell the asians that they have to finish Maplestory 1 and the Black Magician story before releasing a Maplestory 2 game. Because you’re incapable of seeing any game with block-based environments as being its own thing, and instead you needlessly compare them to Minecraft. Tbh, it seems more like portal knights with a way better class system and a more defined outlook on gameplay. Whoa, MS2 news? I thought you would never talk about MS2 again Max. KMS ver. 1.2.295 – MapleStory’s 15th Anniversary! KMS ver. 1.2.294 – Job Balancing & Boss Adjustments!